With its plain 8 MByte embedded memory buffer, 100 MHz operation on all 16 digital lines, and a sustained USB throughput up to 30 MByte/s, the GP-24100 is a powerful general purpose and evolutive PC-based solution that ideally complements your lab equipment for digital electronic system design, test and debug. With its ADWG / pattern generator mode of operation, the GP-24100 allows you to generate extended depths of arbitrary digital stimuli, directly from a PC through a USB connection. 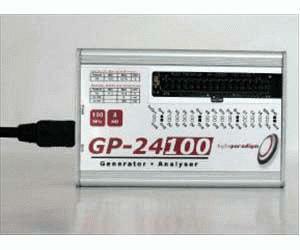 Conversely, the Analyser mode of operation transforms the GP-24100 into a simple logic analyser to collect and analyse digital data. With the GP-24100, generating and collecting digital data to stimulate and analyse electronic systems have never been easier. Moreover, the provided 8PI Control Panel software offers free rich graphical, scripting (TCL/tk) and programming (C/C++) interfaces to automate tasks and make a bridge between your own programming environment and a real hardware prototype.